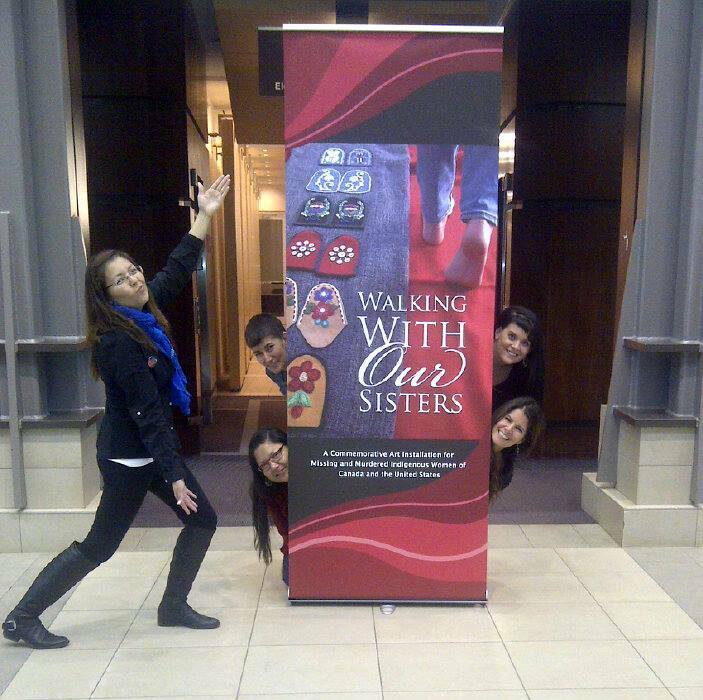 On October 2nd, 2013 Walking With Our Sisters opened in Edmonton at the Telus Centre Atrium, University of Alberta. This was the first of what will be many such openings as the WWOS exhibit will be touring nationally until at least 2019. As with all the stops along the tour part of the planning leading up to the opening included Community Conversations. A one day symposium “AMIQAAQ III: Ending Violence Against Indigenous Women” was also held at the University of Alberta while the exhibit was installed. The WWOS Exhibit attracted media attention from the Globe & Mail. Robert Everett-Green interviewed WWOS’s Tanya Kappo (Lead Coordinator, Media Contact & “Keeper” Support) who had this to say about the exhibit. A few weeks prior to the opening Christi Belcourt was interviewed by Red Man Laughing’s Ryan McMahon about the Walking With Our Sisters Project. You can listen to the interview here. On the weekend of Sept 7 – 8, 2013 volunteers in Edmonton met to open the boxes for the first time and reflect on what the project means. The videos below capture those reflections. From start to finish many volunteers ensured that the vamps were safely packed, delivered and installed, WWOS thanks everyone for their contribution to a successful and moving exhibit! The Edmonton organizing committee and national collective members: Tanya Kappo (standing), Lisa Periard (top left), Tara Kappo (bottom left), ErinMarie Konsmo (top right) and Tracy Lee Bear (bottom right) share a lighter moment after a very intense, emotional and spiritually moving two weeks in Edmonton. Walking With Our Sisters is an art installationthat honors the lives of our Indigenous women and girls – our mothers, ourdaughters, our sisters, our nieces, our cousins and our granddaughters – who have become missing and murdered. We invite you to join us at the premiere of this international touring art exhibit that opens at the Telus Centre’s Atrium (111 Street and 87 Avenue NW), University of Alberta in Edmonton on October 2, 2013, running through to October 13, 2013. 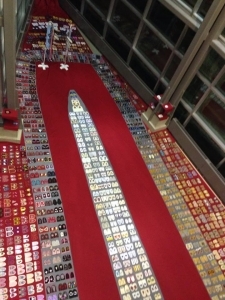 The exhibit will open with a ceremony on October 2, 2013, starting at 7:30 a.m. at the Telus Centre’s Atrium. 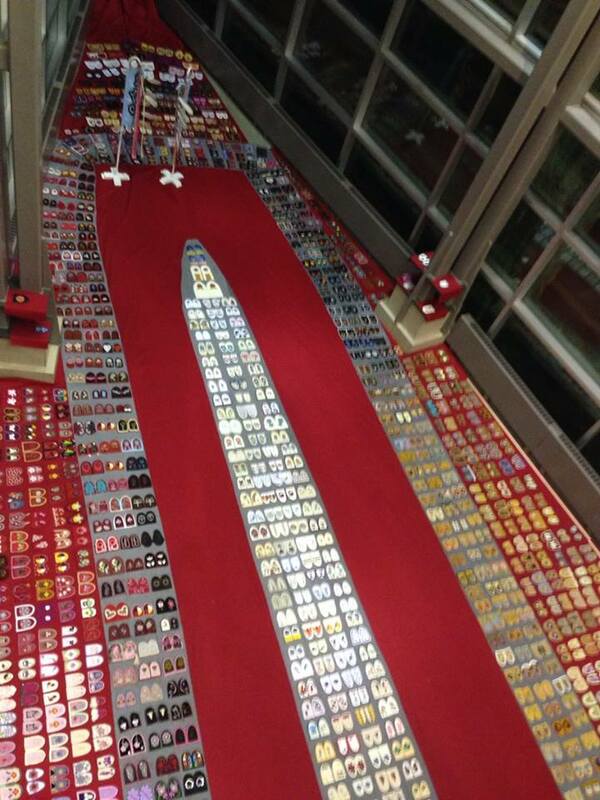 Following the ceremony, the installation will be open to the public beginning at10:00 am on October 2, 2013. The regular hours for the duration of the October2 – 13, 2013, exhibit will be Monday to Friday 9:00 am – 9:00 pm and Saturday and Sunday 9:00 am – 5:00 pm. Visiting the exhibit is free of charge. Also on the opening day, October 2, 2013, therewill be a Tea and Bannock Reception, hosted by the U of A Aboriginal Student Services Centre. This will be held at the Dinwoodie Lounge (2nd Floor,Students’ Union Building, University of Alberta at 8900 114 St NW) from 10:00am – 12:00 pm. You are more than welcome to this free event. Lead Coordinatorof WWOS, Métis artist Christi Belcourt will be in attendance forthe opening of the Exhibit and for the Tea and Bannock Reception. In recognition of your relationship with the women and girls we honour, there will also be remembrance ribbons and a special guest book available for you. And, we would like to let you know that family members and friends are invited to bring forth an eagle feather or a hawk feather at anytime during the exhibit, as a remembrance to your loved one that will be attached to one of the to eagle staffs that are part of the exhibit. They were dreamed by Anishinaabe knowledge holder Peter “Alo” White (NaotkamegwanningFirst Nation, Treaty 3 Territory). One staff is in honour of those still missing and the other staff is in honour of those who have been murdered. This project has already brought together thousands of people from North America and is increasingly becoming a form of justice and healing by bringing us together through art, ceremony, remembrance and community. We sincerely hope to see you during the exhibit as we honour and pay tribute to your loved ones.